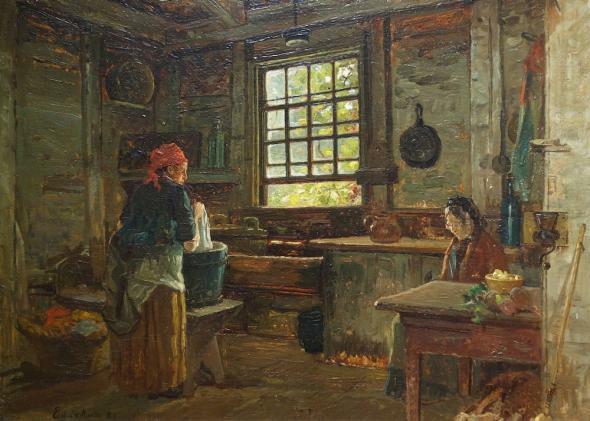 “Old Colonial Wash Kitchen,” John Joseph Enneking, 1883; New Britain Museum of American Art. Joan P. Bines’ Words They Lived By: Colonial New England Speech, Then and Now is a collection of words that are still familiar today, but that were used in totally different ways in colonial New England. Bines, director of the Golden Ball Tavern Museum in Massachusetts, follows words in several categories (work, drinking, the military, the sea) from the everyday contexts of colonial life through to the present day. Each word, as you might expect, contains a little story about the way life was once lived. Backlog: Then: The largest log in the fire, set at the back of the kitchen fireplace to provide warmth. Housewives built smaller fires closer to the front, where they could control the heat for cooking. Now: A surplus, a reserve; or, less comfortably, a list of orders yet to be filled or emails yet to be answered. Humble pie: Then: Entrails of a deer were called “the humbles.” Servants might eat a pie filled with minced “humbles.” Now: To eat “humble pie”: to make a sincere, shame-filled apology. Logrolling: Then: “A community get-together for mutual assistance,” in which neighbors came together to help a new settler clear a cabin site of its trees. Now: Mutual back-scratching, as done by politicians; the connotation has become distasteful. Mechanic: Then: Any of a class of respected, skilled craftsmen who made things with their hands: goldsmiths, cabinetmakers, blacksmiths. Now: Somebody who works with engines or machines. Negligee: Then: A “dress that opened in the front to show the handsomely decorated petticoat beneath.” Now: The word, used only for lingerie, has a decidedly sexier connotation. Pioneer: Then: In the colonial military, “a foot soldier who was sent ahead of the troops to repair roads, dig trenches, and open the way for the others.” Now: The word has a more generalized meaning: a person who settles on a frontier, or works in unknown intellectual territory. Plantation: Then: Simply a planted area; sometimes used to indicate a farming settlement or community (see: Plimouth Plantation). Now: Usually used to describe a large estate, held by one person; the word is now intertwined with the practice of slavery. Sad: Then: In an object: Of muted color (flax, puce, somber green). In a man: Grave, serious, trustworthy, firm. Now: Unhappy or sorrowful. Tenterhooks: Then: Hooks lining a wooden frame, or “tenter,” used to stretch washed woolen cloth after weaving. Now: “On tenterhooks” means to feel emotionally strained or anxious—a direct derivation from a vanished everyday craft. Truck: Then: Goods used for trade or barter in a cash-poor economy (furs, pots and pans, bullets). Vegetables grown at home and taken to market. Later, a single-axeled carriage drawn by two horses. Now: A vehicle meant for hauling. Wallet: Then: A knapsack that might carry enough provisions for a trip of a few days. Now: A small billfold that holds money, credit cards, and mementoes.